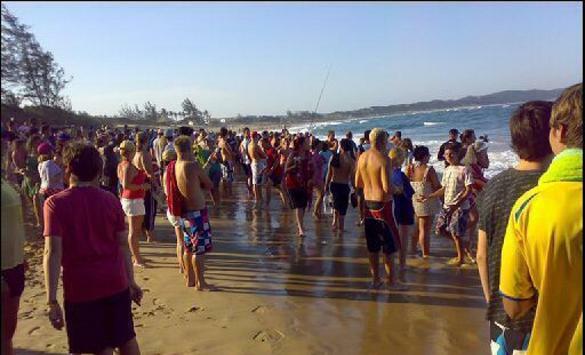 This report in from Mozambique: On Tuesday December 22, 2009 at about 2:00 PM a juvenile Tiger Shark came swimming into the bay of Ponta do Ouro and attacked a young man on holiday here who was playing in the surf with some friends on an inflatable lilo about 2 meters off shore. The skipper from Simply Scuba, Wayne, and James a staff member from Scuba Adventures were busy working in the launch area when they saw this guy come stumbling out the water bleeding heavily. They immediately rushed to assist and phoned Sandy from Brittlestar Guesthouse for assistance. At that stage Sandy was in Manguzi but she referred them to Karl who immediately got hold of oxygen and rushed down to the beach where the guy had already collapsed because of shock and blood loss. He had been attacked by the shark and was bitten on the upper arm/shoulder area and on his hand. Fortunately the wounds were not severe, but the poor guy was in shock and had to be stabilized. Wayne and Petro from Simply Scuba stayed with the victim while he was taken to the local clinic for attendance. Daryl, a paramedic and skipper for Gozo Azul helped to get the patient stabilized but failed to get a drip inserted into the victim’s arm. He then decided to just stop the bleeding and bandaged up where needed. The local commandant of police, arrived at the scene and gave permission for the patient to be airlifted by helicopter and taken to hospital in Manguzi. Colin, a resident of Maputo who owns a holiday home in Ponta fortunately had his helicopter in Ponta and could assist immediately. The man was flown to Manguzi Hospital and transferred to Empangeni Hospital from there. He is fine.